It seems that Passover always comes during an immensely busy time for me at work. Last year's Seder came during a big project at work and consisted largely of store bought items since I only had 45 minutes (including my drive home) to prepare the feast. This year was a comparative luxury with an hour and a half to prepare for dinner! This is more time than I generally have so I used the first half hour to completely clean the kitchen from our lamb and pastry mess of the weekend. 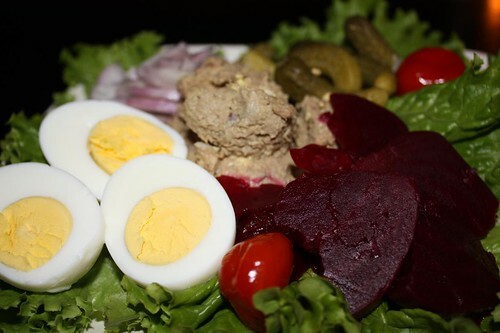 For starters I made this plate of chopped liver which I served with Rick's Picks Phat Beets, cornichons, and sliced shallots. This alone may have constituted a pretty good dinner. I've gotta say that I'm not really a huge fan of chopped liver. Every time I eat it I grow a deeper understanding of the expression, "What am I chopped liver?" I also made some hard boiled eggs to go along with the plate. This is one of Jen's least favorite food items in the entire world so I knew I was on my own with these guys. My excitement for hard boiled eggs, while enormous in comparison to Jen's, is still a bit on the low side. Still, it's tradition, and you can't argue with tradition. You can, however, eat a mess of cornichons, and pickled beets. The smoked sable also took a bit of the edge off. 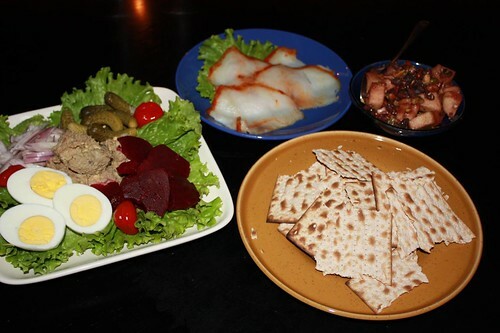 I also broke up some matzoh to serve with this Jewish meze platter. Overall I think next year we should maybe try to traditionalize foods that we actually enjoy to have a more favorable experience. I also realized that I could have simply made a giant bowl of charoset and Jen would have been just as happy. 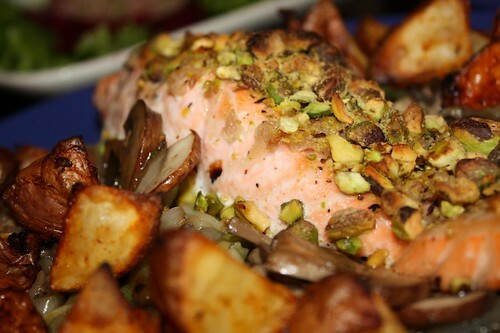 For the main course I ground up some pistachios and layered some fresh horseradish on these salmon fillets. I roasted them in the oven along with some paprika and garlic coated new potatoes. I also sweated some spring onions with baby portobello mushrooms. Last year we had Manischewitz and I can't classify it as anything other than a terrible mistake. 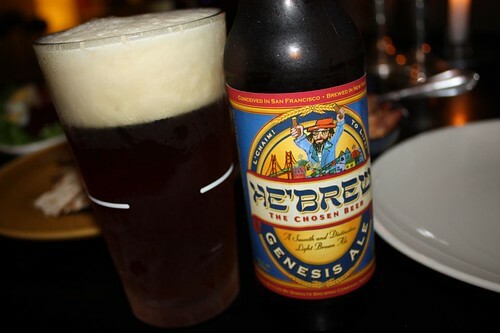 This year I opted to go with something local to New York and not a sickeningly sweet wine: He'Brew: The Chosen Beer. 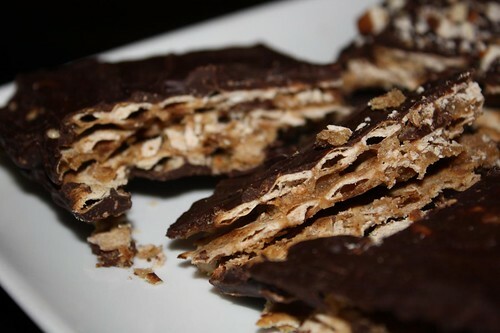 Yesterday I made this matzoh crunch which is one of my all time favorite desserts. I coated one with sliced pecans and left one natural. We enjoyed this with some non-traditional lemon zinger tea. We also wondered if there were any traditional Passover movies like A Christmas Story. After not discovering any we opted to create our own: Love and Death.